We need to mark a new Independence Day. This day would entail a celebration of our movement away from corporate rule. It would also mark an anniversary of our coming to consciousness that we don't need corporations. We have the power to support ourselves! WE can create jobs within our community, keeping the precious little money flowing locally rather than being syphoned off. What we need is a system composed of cooperatives, which, as the term signifies, means cooperation more so than competition and survival of the fittest, which is the motto of corporations. This move towards cooperatives is more about a mindset than it is business model. Of course, so is the corporate system. The difference is the corporate system is about making a profit for shareholders whereas the cooperatives entail a working together of people within a community to meet the needs of that community. Our governance, as well as our behavior, should operate in relation to the community as well as the rest of the planet. "Act local, think global" is a good motto. In ancient cultures, this dictum amounted to thinking through the results of a decision seven generations into the future. In our modern corporate system, we consider a five-year plan as long-term. Within that five-year business plan, the goal is gaining a profit of what amounts to being a meaningless accumulation of dollars, which is nothing more or less than on and offs in a computer memory bank. It's an illusion. The way to increase profits is to add ever more zeros=offs after your one=on. Revealing this illusion is the beginning of our not being beholden to bought-and-sold bureaucrats masquerading as leaders who are, in essence, rapists of the planet and our Souls. These Souls include those of our children. And it's all just a sleight of the hand, a magic show. However, exposing the cheap tricks and cheats behind the magic show leads one to the dangers of getting black-listed, scorned, jailed, or killed in a mysterious accident. Ask Cassandra or any prophet. They will tell you that the hidden truth does not set the first person to reveal it free. Can there be change? Imagine our children being educated within a community system in which the epistemological root of the term, educate, is realized as meaning "to unfold." To unfold what? The child's potential. This system would be counter to the "teach to the test" modality in which the child's inherent being matters little. Education needs to become more than indoctrination and should be grounded in unfolding children's potential in relation to who they are and how the can contribute to their community and world. Nature does not work on standardization. She works on diversification. Variety increases the chance of the survival of the ecosystem. Standardization makes us at risk for a disease attacking a particular crop, which then could result in a serious diminishment of food for our human mouths. Variety in how we act towards the planet is imperative to survival. Thus there are gardening and farming methods that move beyond the monoculture cropping of standardized farms and into systems that mimic Nature in terms of producing variety. 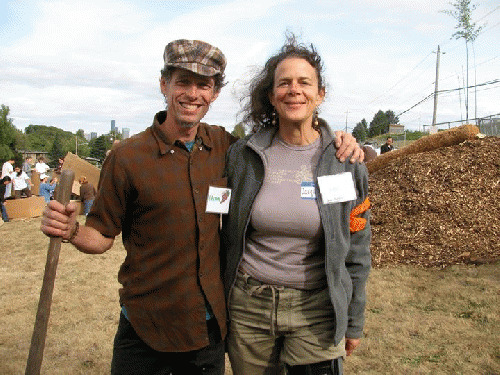 One of the organizations that foster this natural process is the Beacon Food Forest of Seattle, Washington. The goal of this food forest is to design, plant and grow an edible urban forest garden that inspires the community to gather together, grow their own food and rehabilitate their local ecosystem. Not only is the program about growing food and being ecologically sustainable, it is about people bonding together in getting their needs met. Could this mean the beginning of our moving away from states of alienation to that of belonging? On a deeper level, the program helps the community to become less reliant on corporations as well as the government. It empowers people in the community. In some ways, the program illustrates psychiatrist Eric Fromm's thesis put forth in Escape from Freedom that we have surrendered our freedom over to governments and corporations. Why do we escape? Is our taking responsibility for our lives and our governance too much to bear? Perhaps Eve (labor) wasn't cursed into submission to Adam but has allowed him to rule over her. Eve needs to tell Adam to take a hike. This should be a new chapter to our religious texts. Could programs like the Seattle Food Forest reclaim freedom for all of us? It appears many believe so, including many of the local politicians of the area who are supportive of it. Could the Food Forest be a "win -- win" situation for local government and the people that the government serves? Who needs to manage food stamp programs when you're producing food and food-related jobs in your own vicinity?